What proportion of your budget should you be spending on radio? 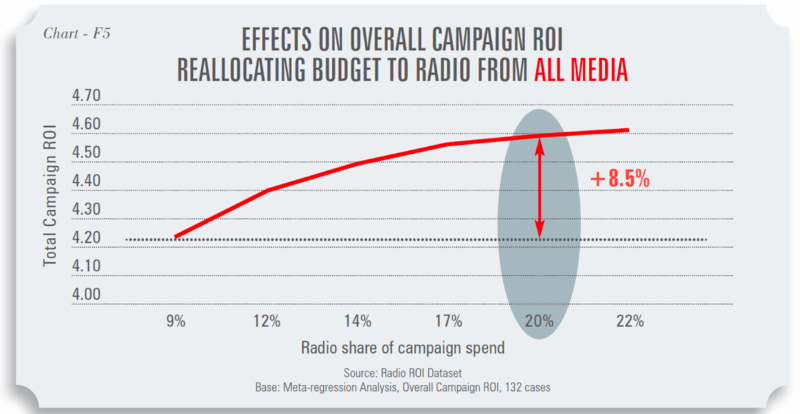 Econometric analysis of 132 multi-media campaigns demonstrates that allocating a higher than average share of budget to radio can reap significant rewards in terms of overall campaign return on investment (ROI). When budget is reallocated to radio equally from other media in proportion to their current level of spend total ROI increases peaking with radio share hitting 20%, at which point overall campaign ROI is 8.5% higher. This finding argues strongly in favour of redeploying budgets from other media into radio but the optimum mix is likely to vary by campaign depending on sector, the current media mix, and relative effectiveness of individual media, where known.